The polyurethane dispersions are two-component systems in which polyurethanes are dispersed into various liquefying agents. There are two major types of polyurethane dispersions based on the liquefying agents used to disperse them that are, water-based and solvent-based. The global polyurethane dispersions market is projected to be worth USD 2.04 Billion by 2020, registering a CAGR of 6.8% between 2015 and 2020. In this study, 2013 has been considered as the historical year and 2014 as the base year for estimating market size of polyurethane dispersions. This research study used extensive secondary sources, directories, and databases, such as Hoovers, Bloomberg BusinessWeek, and Factiva to identify and collect information useful for this technical, market-oriented, and commercial study of the polyurethane dispersions market. The primary sources are mainly several industry experts from core and related industries and preferred suppliers, manufacturers, distributors, service providers, and organizations related to all segments of the industry’s supply chain. The bottom-up approach has been used to estimate market size of polyurethane dispersions, type, application, and region, in terms of value and volume. The top-down approach has been implemented to validate the market size, in terms of value and volume. With the data triangulation procedure and validation of data through primaries, the exact values of the overall parent market size and individual market sizes have been determined and confirmed in this study. Polyols and isocyanates are the primary raw materials required for the manufacturing of polyurethane dispersions. Raw material suppliers to polyurethane dispersions manufacturers are mainly categorized into two groups, namely, basic chemical companies, and companies supplying machinery and equipment used in the production of polyurethane dispersions. Companies supplying basic chemicals such as prepolymers, polyesters, polyols, isocyanates, TDI and MDI are the general chemical companies, such as Covestro AG (Germany), BASF SE (Germany), The Dow Chemical Company (U.S.), and many more among others. Polyurethane dispersions manufacturing companies process prepolymers using different processes and manufacture water-based or solvent-based polyurethane dispersions used in wide variety of CASE applications. 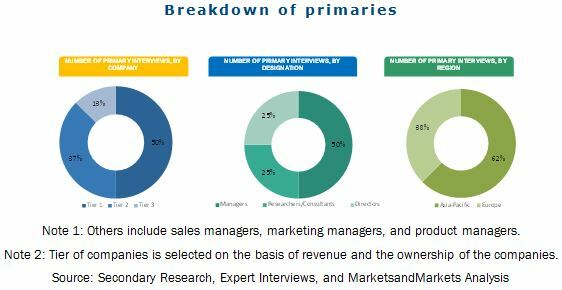 This research report categorizes the market for polyurethane dispersions based on type, application, and region and forecasts revenue growth and analysis of trends in each of the submarkets. On the Basis of Type: The polyurethane dispersions market is segmented on the basis of type, such as water-based polyurethane dispersions, and solvent-based polyurethane dispersions. Each type is further described in detail in the report with value forecast till 2020. On the Basis of Application: The polyurethane dispersions market is segmented on the basis of application that include coatings, adhesives & sealants, synthetic leather production, fiber glass sizing, and other applications is further described in detail in the report with value forecasts till 2020. On the Basis of Region: The polyurethane dispersions market is segmented by region as Asia-Pacific, Europe, North America, and RoW. Each region is further segmented by key countries such as China, India, Japan, South Korea, Thailand, the U.S., Germany, Italy, France, the U.K., the Netherlands, and Spain. The global polyurethane dispersions (PUDs) market size, in terms of value, is projected to reach USD 2.04 Billion by 2020, at a CAGR of 6.8% between 2015 and 2020. In terms of volume, the market is projected to reach 402.3 kilotons by 2020, at a CAGR of 5.1% during the forecast period. The high potential from the textile and leather industry, increasing global demand for automotive and continuous expansion, and merger & acquisition activities undertaken by different companies are the key factors for the growth of the global polyurethane dispersions market. The water-based PUDs are projected to be the largest and fastest-growing type of polyurethane dispersions between 2015 and 2020. The water-based PUDs are of great importance due to their extraordinary characteristics of containing lower levels of volatile organic content (VOC). Further, water-based PUDs are versatile and environmentally friendly coating materials that are available in a wide range of film hardness and solid content. They contain no free isocyanate residuals and possess high blocking resistance, weather resistance, long-term flexibility, UV resistance, and high abrasion resistance. Owing to all the required characteristics of coating materials water-based PUDs are considered to be rapidly growing segment of the polyurethane coating industry. The synthetic leather production application is the fastest-growing application in the global polyurethane dispersion market. This is due to the major industrial manufacturers are using synthetic leather in footwear, handbags, apparels, automotive, interior, and other sectors. More importantly, the PUD synthetic leather is low in volatile organic compound and is environmentally friendly. High solid polyurethane dispersions make it possible to economically produce synthetic leather without the use of solvents. Thus, the growing production of synthetic leather requires high amount of polyurethane dispersions which ultimately drive the PUDs market for this application. Asia-Pacific, being the largest market for polyurethane dispersions is also projected to register the high growth market, in terms of value between 2015 and 2020. Accelerating demand from end-use industries such as coatings, leather production, adhesives in Asia-Pacific is driving the growth of the polyurethane dispersions market. Tremendous development in infrastructure and increasing demand of coatings and adhesives in various end-use industries such as automobile, textile, and leather is expected to drive the PUDs market in this region. 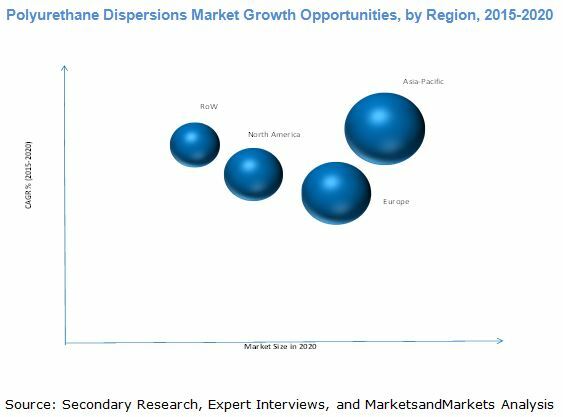 Though the polyurethane dispersions market is gaining importance at a fast pace, but few factors act as a bottleneck towards the growth of polyurethane dispersions market. The high raw material price is the major restraint toward the growth of the polyurethane dispersion market. Methylene diphenyl diisocyanate (MDI), Toluene diisocyanate (TDI) and polyols are major raw materials for manufacturing PUDs. Prices of these raw materials play a major role in determining the polyurethane dispersions market growth. This is one of the major disadvantages for this industry, as polyols and isocyanates are derived from crude oil. The companies such as The Dow Chemical Company (U.S.), Mitsui Chemicals (Japan), BASF SE (Germany), COIM (Italy), Covestro AG (Germany), Chase Corporation (U.S.), and Cytec Industries (U.S.) are the dominant market participants in the global polyurethane dispersions market. The diverse product portfolio and strategically positioned R&D centers, continuous adoption of development strategies, and technological advancements are few factors that are responsible for strengthening the market position of these companies in the market. They have been adopting various organic and inorganic growth strategies such as expansions, mergers & acquisitions, joint ventures & collaborations, and new product launches to enhance the current market scenario of polyurethane dispersion. 11.12 ICAP-Sira Chemicals and Polymers S.P.A.